One of the important duties I have as AAS Executive Officer since the 2008 passage of our anti-harassment policy is the confidential processing of claims of harassment. Because few in our community are trained to handle investigations into behavior covered by our policy, the AAS contracts with an experienced human-resources (HR) professional to undertake investigations into accusations by contacting the accused, the accuser, and any witnesses identified by either party. We take this process very seriously and therefore proceed slowly, confidentially, and rationally. This can be frustrating to all involved, but it is necessary. As of today, we have had only six complaints under this policy, two of which are still open and four of which have been resolved. A recent issue of the AASWomen newsletter highlighted a blog post by two anonymous women who were harassed physically while at a conference. The post greatly upset me, as it appeared similar to a current complaint I am dealing with. While maintaining confidentiality, I have verified that the harasser profiled in the blog post was not the individual in the current case. Meanwhile I’ve been informed of two more such incidents, neither of which resulted in a formal complaint but probably should have. They’re all shockingly similar, all shockingly disappointing, and all shockingly wrong behavior. Enough is enough. As our outgoing President Meg Urry stated at the opening of the AAS summer meeting in San Diego, professional conferences are for science, not for dating — and certainly not for harassing, which must not be tolerated anywhere at any time. We have made this abundantly clear with signs at our meeting venues and messages online, in our meeting app, and in our printed materials. I remain shocked that some of my colleagues have still not gotten the message. I’m appalled, actually, and I am set now on a course of action to eliminate this kind of unwanted, inappropriate behavior from our professional conferences. First, if anyone is harassed at our meetings or events, I want to hear about it. We have kept six cases 100% confidential and have minimized negative repercussions for those filing complaints to the best extent possible. As far as I am aware right now, there have been no negative repercussions for any complaint filer based on their filing with us, and that is what I want to continue to accomplish. We will do the same for anyone who comes forward with a complaint. This is very, very important, for without complaints, the Society cannot take any action against a harasser. If we cannot take any action, the harasser will continue in their behavior at our events and continue to threaten others in the future. So please, trust us to help you, count on the support of your colleagues, and come forward with your complaints. 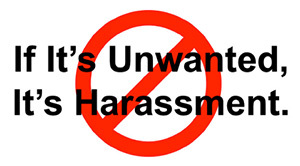 I have begun studying the idea of a harassment information escrow system to help, but there are legal, logistical, and functional challenges with such systems that have to be thought through before they are implemented. Second, do not treat any AAS meeting or other event as a venue for finding a romantic partner. Yes, there are people at our events, and yes, people do make romantic connections, and yes, there may even be opportunities to make such connections at our events, but please, everyone, just shelve these inclinations for our conferences. Too much damage is being done. Just one negative interaction in the poster hall, at a session, in the bar during the meeting, or at a restaurant or offsite event may be all it takes to dissuade a bright young scientist from participating in our field. This is unacceptable, and it needs to stop. Finally, touching other people carries meaning and import. For some, touching within certain boundaries is not a problem, but for many it is a violation of personal space. Some touching is acceptable in a professional environment, but most touching is inappropriate. Therefore, except for a professional handshake or a hug for a long-time friend, shared with mutual consent, touching of any other kind at professional conferences should be avoided. For some in our community, this seems to be a difficult behavior to resist, but the Society must ensure that everyone attending our conferences is comfortable, and this means not tolerating inappropriate touching or physical contact that makes anyone uncomfortable. I am heartbroken at the damage some in our community have caused, and I am deeply disconcerted that some are acting so inappropriately at AAS conferences. It has to stop. We need to work together to stop it, and that means a collective effort to establish a different cultural norm at AAS events than elsewhere. I think we can do this, but we must all work together to make it happen. Some of our members and other meeting attendees are likely going to be upset at this message, claiming that they act responsibly and with consent — why should they curtail their social activities at meetings just because a few bad actors are ruining things? I get that. I understand that. I enjoy the social aspects of being human, being at a conference in an interesting place, and being engaged in such an exciting field of research with people I find interesting and might even want to dance with, drink with, dine with, or whatever. But I am distraught over the damage that has been done and could be done in the future. Frankly, it is not worth the social happiness of a majority if just one of our attendees is made to feel uncomfortable, under pressure, or damaged enough to leave our profession or to attend future conferences in a fearful state. The Society will continue to receive complaints under our anti-harassment policy, which covers not only sexual harassment, but also other forms of harassment. We will pursue investigations into claims of harassment confidentially, thoroughly, and professionally. When sanction of some form is called for, sanction will be brought. But what would be better — so much better — is if everyone put themselves on watch, reined in their behaviors and inclinations, and realized that by doing so, they are helping to further our shared goal of enhancing and sharing humanity’s scientific understanding of the universe. We can and must do this, and we must do so now. Enough is enough.